The Syrian government claims Israel attacked. 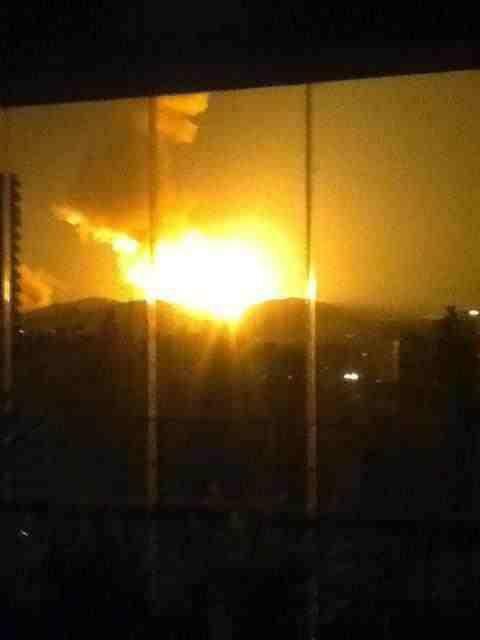 A massive tower of flame lit the Syrian capital Damascus Sunday, an explosion the Syrian government described as an Israeli attack. If true it would be the boldest foreign incursion yet into the Syrian conflict, and a clear sign that Western air forces can penetrate Syrian air defenses if needed. "The new Israeli attack is an attempt to raise the morale of the terrorist groups which have been reeling from strikes by our noble army," Syrian state television said, according to Reuters; the government often describes opposition fighters as terrorists. State television said the target was a research center on the outskirts of Damascus. Israeli officials have confirmed that the Israeli airforce struck a Syrian target Thursday night, saying they hit a shipment of arms destined for the Lebanese militant organization Hezbollah. "We don't respond to this kind of report," an Israeli military spokeswoman told Reuters of Sunday's explosion. Israel just sent the message that Assad lives at its discretion. Israel just sent the Pentagon a message too about air defenses.